Victoria Simmonds studied at the Guildhall School of Music and Drama. From 2000-2005 she was a company principal at ENO singing roles including Nancy T’ang/Nixon in China, Cherubino/Figaro, Zaida/The Turk in Italy, Pitti-Sing/The Mikado, Ascanius/The Trojans, Rosina/The Barber of Seville, Dorabella/Così fan tutte, Hermia/A Midsummer Night’s Dream and Zerlina/Don Giovanni. 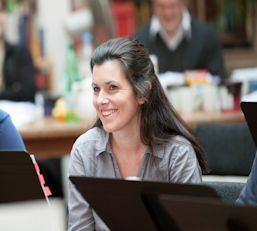 For Opera North she created the title role in Jonathan Dove’s highly acclaimed The Adventures of Pinocchio. She has also sung for Grange Park Opera, Garsington Opera, Opera Holland Park and the Buxton Festival and sang the title role of Carmen at the Royal Albert Hall. Abroad she has sung with the Netherlands Opera, Stuttgart and Halle Opera companies and Wellgunde/Das Rheingold with the Berlin Philharmonic under Sir Simon Rattle at the Aix Festival. In concert, she has sung in Le Comte Ory and the title role of L’Enfant et les Sortilèges at the Concertgebouw, and has worked with the Philharmonia, the Hallé, the Salzburg and Edinburgh Festivals and for the London Symphony Orchestra under Sir Colin Davis at the BBC Proms. Recordings include Bellini’s Il pirata for Opera Rara, Janacek’s Katya Kabanova (Varvara) for Chandos and Cefisa in Ermione by Rossini for Opera Rara.